At First Baptist we are a church that ministers to all generations. We think of faith as a journey and recognize the ways our understanding and approach to faith, the Bible and church change with our life experiences. We believe that Jesus’ commandment to love God “with all of your mind” applies to adults as much as children, so we value adult education that challenges as much as it nurtures and inspires. We also know that one thing is necessary no matter where you are in your journey of faith: meaningful relationships. FBCX is a place where adults of all life stages are welcomed, prepared for and cared for. The “bread and butter” of our ministry for adults is adult Sunday School, which meets on Sunday mornings at 9:45 a.m, before worship. We offer a wide variety of classes, each with their own distinctive personality and approach to Bible study and fellowship (though almost all of them value donuts and coffee on a Sunday morning). Some are age specific, others aren’t. You can learn more about each class here, or just come on a Sunday morning and one of our greeters can help you find a place to land. And we also know relationships aren’t “one size fits all,” so don’t be afraid to “shop around” until you find a group that’s right for you. This intergenerational class is a unique blend of median and older adults, single, married and previously married. All are welcome here! Topical studies and guest speakers form the lessons in the Seekers class. This intergenerational class of women studies women in scripture, their struggle of life and faith, and how what we learn through their story impacts our own faith journey. We offer a variety of short-term classes at different times during the year, typically in the seasons of Advent, Lent, and over the summer. Our young adult group meets on Sunday evenings at the home of Emily and Shaun Kell. Our seniors gather for breakfast in the fellowship hall the first Tuesday of every month at 9 am. No need to sign up, just come and enjoy the fellowship! Wednesday night fellowship and prayer meeting are also important at First Baptist. We gather most Wednesday evenings during the school year for supper in the Fellowship Hall, and then stay around the tables for a time of sharing: birthdays, anniversaries, announcements and prayer. The children break off into their choirs and missions groups and the adults stay in the fellowship hall for a discussion-based Bible study, usually led by the pastor. However, we have a “deep bench” here at First Baptist, so it’s not unusual to hear from one of our several university professors or other seminary trained members. All voices and perspectives are welcome and valued, so the discussion is almost always lively. At First Baptist we’re a church that isn’t afraid to take on big issues. One of the ways we do this is through our Spring Ethic Series. This series began several years ago as a friendly, moderated debate where different members of the church would present opposing sides of issues facing the church, such as the death penalty and the Christian response to homosexuality and immigration. In recent years the series has shifted to a four-week long engagement with issues, featuring respected voices from around our community and the greater church. Recent topics have been poverty and issues of food sustainability. And yet we also hope for these discussions to be more than just discussions, and do our best to respond in some way as a church in light of the new information and perspectives we engage. One of the more recent additions to our adult education ministry is FBCX University (FBCXU, or affectionately “Alphabet Soup”). On occasion following worship on Sunday morning we gather for lunch in the Fellowship Hall and then split off into workshops offered by our ministry staff and other members of the church on a variety of topics centered on the intersection of faith and life. Recent workshops have included discussions on how to talk to children and youth about matters of faith, a Bible study on “the cursing psalms,” end of life issues for care-givers and care receivers, a study of the liturgical year, an introduction to centering prayer and many others. Our annual women’s retreat in the fall at St. Simons Island is the highlight of our women’s ministry. Since 2000, First Baptist women have gathered together for a weekend of learning and community building with plenty of good food and free time built in. It is a weekend that many of our women look forward to all year long. 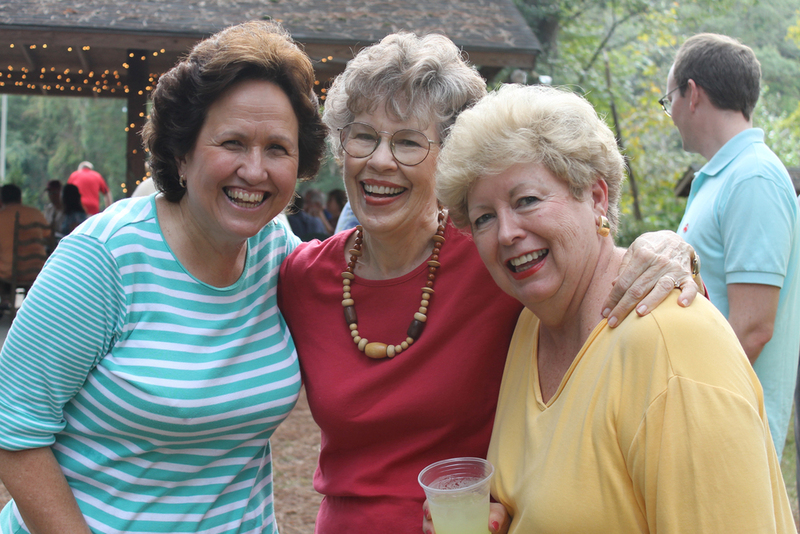 Small groups of women gather together regularly in discipleship groups and missions groups as well. If you’re looking for a group with whom to get involved, ask a member of the ministerial staff. Our Men’s ministry is highlighted by a Men’s Retreat in the spring. We have also convened for a summer “Back Porch Book Club” at Scott’s house, and other times for fellowship and conversation.